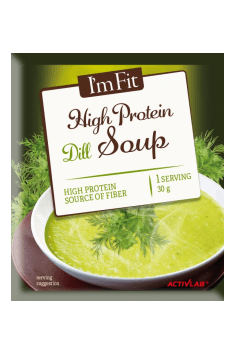 High-protein dill cream soup I’M FIT is an extremely easy way to prepare a quick, filling and nutritious meal. You just need to mix it with hot water to enjoy a delicious and healthy dish. High-protein cream soup I’M FIT has been created for people who have a limited amount of time at their disposal but give the quality of their meals a lot of importance. It is based on products of natural origin, thanks to which it has a high nutritional value. Its highly refined taste was achieved without the help of artificial flavour enhancers, only with the use of natural spices and dried vegetables. The product does not contain aspartame and is characterised by low sugar content. The form of the cream soup makes it possible to transport it easily and prepare it quickly. It is closed in sachets which contain one portion of the product each. Thanks to that, it can be easily taken to school or work and eaten during a break. Preparing the cream soup requires only a bowl or a mug, a spoon, and 200 ml of hot water. A moment of stirring is enough to make a highly nutritional meal. Because of its high content of dietary fibre, the cream soup fills you for a long time but does not provide too many calories. One portion of the product are only 106 kcal. Importantly for physically active people, the product is characterised by a high protein content. Thanks to that, it is a great alternative for a complete meal, which also makes it better than ordinary soups. It can constitute an easy complement of a daily protein supply, or it can serve as a full meal in a low calorie diet. Importantly, a great majority of protein in the product is of animal origin, thanks to which it is characterised by high bioavailability, providing amino acids in optimal proportions. An advantage of the cream soup is certainly its versatility. It can be used successfully as the first dish during lavish lunch for people who care about their body, but it can also be an independent hot meal at any time of the day. It is a fantastic option for light lunch or dinner. High-protein dill cream soup I’M FIT is an excellent solution for every person who is looking for a comfortable meal that can be prepared without losing too much time. It is a fully nutritional, filling meal that stands out with it fantastic taste achieved thanks to the use of carefully selected vegetables and spices. Pour the content of a sachet into a bowl or a mug and add 200 ml of boiling water, stirring it constantly until the consistency is even. You can season it additionally as you like. It is best when eaten immediately after preparation. When preparing the product, make sure you stir it intensively immediately after adding water in order to avoid lumps. The cream soup goes well with fresh whole-grain bread or croutons.